I can’t believe it’s been nearly a month since I last blogged! Where has the time gone? I haven’t felt like I’ve been that busy, but I haven’t been great about taking in-progress shots of my current projects which seems to result in me not blogging. Since I last posted, I’ve finished 4 things! The first thing I finished was the Wurm hat I was working on.<p. Yarn: Brooks Farm Solo Silk in a light purple, about 1/2 a skein. Notes: I did the brim a bit different. I did a provisional cast on to do a turned hem for the hat rather then casting on and knitting the cast on edge with your working row as the pattern states. I think this makes for a brim with more stretch. I started with the US 2.5 needles working the first stockinette portion and the purl row, then switched to US 4’s for the rest of the hat. 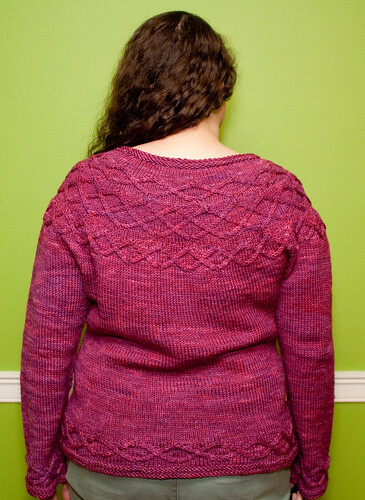 I did 10 purl sections as the pattern called for, which gave me just the right amount of slouch. 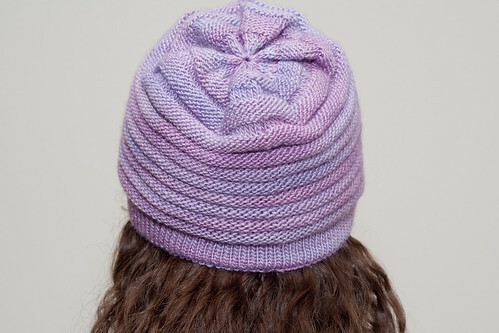 If you like really slouchy hats, I’d recommend doing more then that. 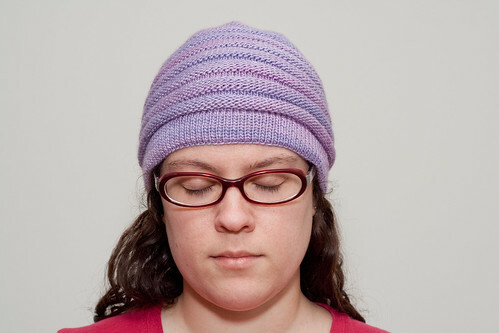 After that last purl section, the hat gets pulled in VERY fast. Overall, I’m happy with how this hat turned out and it’ll be nice for cold days to help protect my ears. Next up is a cute little bunneh made out of my own handspun. 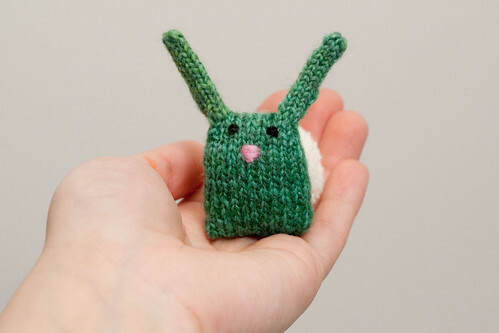 I kept seeing these little guys around on Ravelry and got the urge to knit one OMGRIGHTNOW a few weekends ago. I had this handspun sitting at my desk along with needles and I cast on right away. Worked on him only while sitting at my desk, so he took a few days to complete, but I think it would have gone a lot faster had I worked on him more then just at my desk. Notes: I only used a small amount of yarn. If I had to guess, I’d say roughly 40 or so yards. The pom pom was too big at first, but I cut it down to be smaller. Still a bit big, though I think it adds to the cuteness! 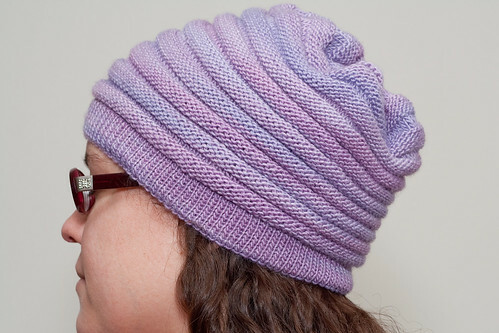 For the pom pom, I tried a new tool, which may now be my favorite knitting related tool ever. I first bought this Clover small pom pom maker from my local Hobby Lobby. I quickly discovered that the smaller one in the package that makes a pom pom 1 3/8 inches big was as big as my bunny nugget! I trimmed it down to size and used it anyway because I was too impatient to wait for the extra small pom pom maker from Clover to arrive. These pom pom makers are FANTASTIC! It makes making pom poms almost painless compared to every other tutorial on how to make them that I’ve ever seen. Totally worth the investment if you make make pom poms at all. 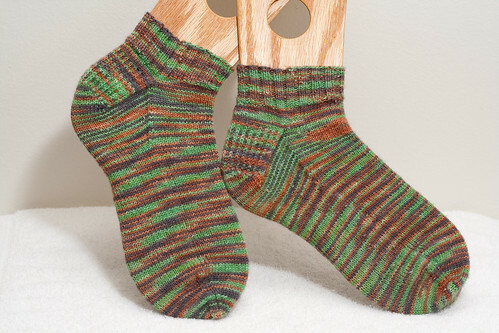 After finishing up Wurm and knitting a Bunny Nugget, I focused on getting Matt’s socks done. With some focus, they were finished pretty quickly! 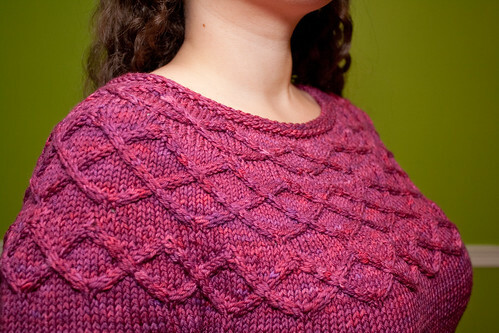 My final FO for February is Seneca. I absolutely LOVE this sweater. 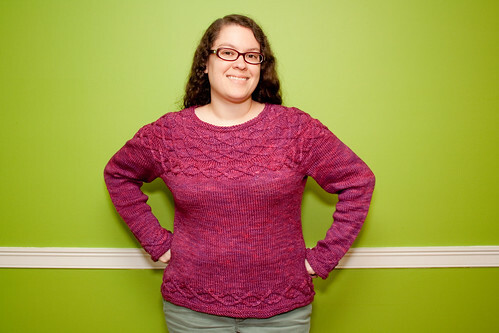 It’s probably my favorite of all the sweaters I’ve knit and other then the minor freak out over the skeins not matching (which turns out isn’t an issue at all), I had no problems with the pattern or fit or… well anything! This is my second sweater of the year, so I’m still on track for knitting 12 this year. I need to get some updated pictures on the current projects I have going since the two main ones I’ve been working on don’t have ANY in-progress shots yet. Hopefully I can do that today or tomorrow and share what’s on the needles for me later this week! Look how busy and productive you’ve been!!! Yay you!!! Lindsey! Your Seneca is gorgeous! I’ve been thinking of starting that. 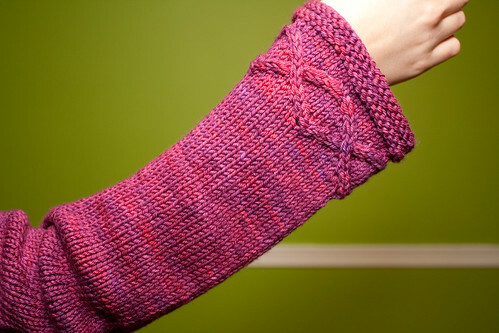 Even swatched on the Madeline Tosh DK…fabric looked a little loose for me. Yours is so so so pretty!! !